Governor Brown Signs the Confidential Health Information Act! 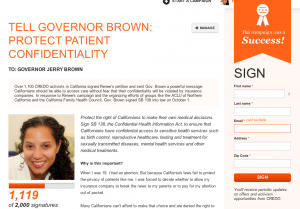 In partnership with the ACLU of California, the California Family Health Council, and the National Center for Youth Law, we created a CREDO Mobilize petition asking California Governor Brown to sign the Confidentiality of Medical Information Bill (SB 138) which gives patients to have additional privacy protections when using insurance. After receiving the over 1,000 signatures on Monday, September 30, 2013, Governor Brown signed SB 138 on Tuesday, October 1, 2013.